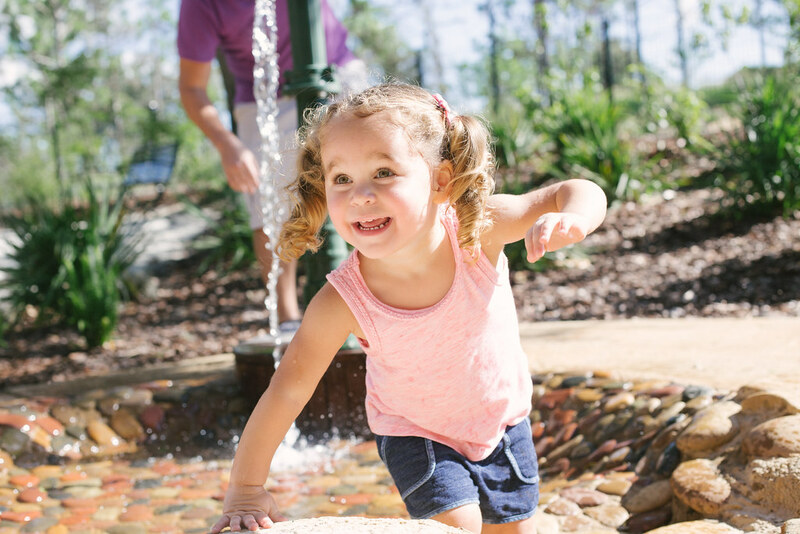 Historic Bok Tower Gardens has added Hammock Hollow Children’s Garden to an already impressive portfolio of family friendly attractions. An easy drive from either Orlando or Tampa the ‘Singing Tower’ and estate is a world away from the theme parks and a great place to spend some family time away from the crowds. Step through our “sneaky” keystone gate and stroll upon the swirls of a pebble mosaic created by sculptor Kevin Carman as your garden adventure begins. Specially created mosaics of a red-headed woodpecker and gopher tortoise compliment smaller mosaics located along the trail and the large mosaic indigo snake in the sand play area. His inky-black pebble mosaic scales may glisten in the sunlight, but this larger-than-life indigo snake sculpture is a friendly fellow who surrounds a tot-sized sand circle encouraging sand play and motor skills. Grab a bucket and feel the sand between your fingers. This area also features exotic bamboo plantings. Cool off in the sparkling springs of River Walk and discover a refreshing display of fountains, spray jets, misters and foggers. Explore plenty of nooks and crannies along the Ledge Walkwith cool, fern-covered rocks reflective of Florida’s remarkable karst limestone outcrop. Jump, climb and scamper through a lively oak hammock that provides a sprawling yet shady canopy for physical and creative play. Words were very important to Edward Bok, a Pulitzer-Prize winning author and the publisher of Ladies Home Journal. The Edward Bok Word Garden is dedicated to his memory. Inspirational words etched in stone are a learning moment about qualities that make the world better. The Fence Swift Stumpery is a garden installation inspired by the agile and acrobatic lizards native to the uplands of Florida. This garden habitat draws attention to the beauty of stumps highlighted by ferns and air plants. Activities include the Fox Den log climb and the whimsical Fairy House Trail where garden fairies can be found living in fanciful, nature-inspired homes. This setting provides an opportunity to highlight plant, animal and human relationships and their dependency upon the forest for food and shelter. Unique plant life here will include hanging Spanish moss, resurrection fern-covered branches and epiphytes growing in the tree crevices. Take a walk through a Cabbage palm forest and play inside a Seminole-inspired Chickee Hut. The homestead has an outdoor kitchen with pots, pans and a vintage water hand pump. This area evokes the historic nature of old Florida and is also home to the Frog Hop that tests even the most skilled jumpers with a series of tree stumps. The Warbler Thicket is a short walk through a honeysuckle tunnel. Take to the stage for a set of garden experiences designed to encourage budding musicians and artists with performing arts and hands-on activities. The Sabal Stage is a venue for special artistic performances and serves as a springboard for impromptu theater with different animal costumes available for creative play. Doodle Bug Art Place and Songbird Music Tree is a home for music and visual arts with a garden gallery to share your drawings and paintings with the next visitor. Tuned acoustic instruments allow visitors to make soft harmonic music evoking the rich musical heritage of Bok Tower Gardens. Parents and kids can also take a rest in the rope hammocks. Nearby is a zig-zag balance beam surrounded by giant acorns sculptures by David Price in the Acorn Chase. Climb and weave your way through this gigantic spider-web-inspired play structure. Walk along the boardwalk and through the Bird Hollow situated along a stunning Cypress grove. Bird feeding stations and plantings for wildlife attract birds and butterflies to this area. Embrace your inner bobcat and stalk through this rocky terrain or take a hare’s quick strategy and roll down a small grassy hill. Cool off by crawling underground into the Gopher Tortoise Burrow. The gopher tortoise is called a keystone species because it shares its burrow with over 350 other types of animals. Now you can be part of the gopher tortoise parade with his other friends. The fallen oak next to the burrow is a where the mischievous Reynard The Fox lives. His crafty ways gets him around the garden unseen. Is this the end or is this the beginning? A backyard can be an exciting place to grow vegetables, flowers, and shelter for wildlife. This area is a ramble of plants for wildlife, food and fun.